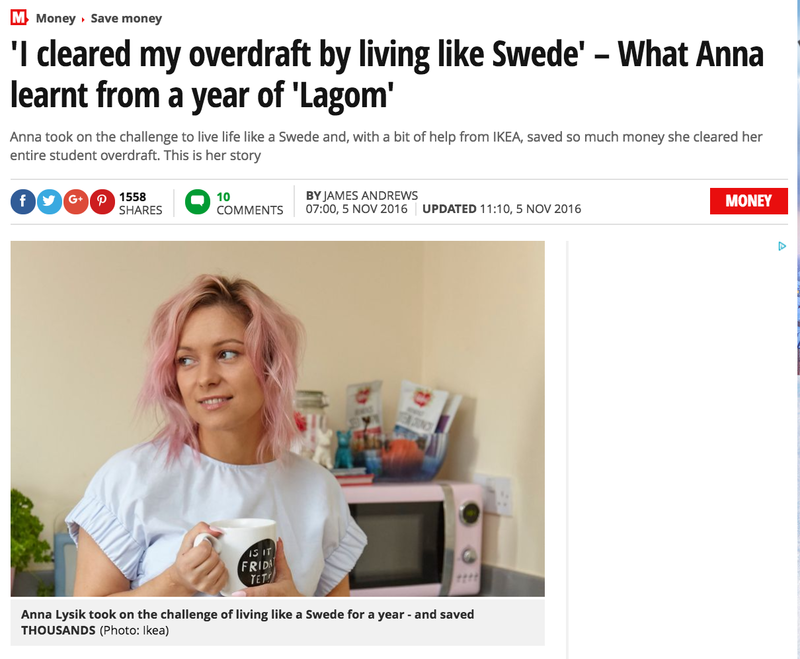 In January, I became an IKEA Live Lagom ambassador and little I knew then how this will change my lifestyle. I have graduated 3 years ago, with hopes and dreams like every other student. I used to live with my boyfriend in an outskirt of Manchester. We were renting a small room above a takeaway and shop on a busy road. I wasn’t working on my last months of university, only relying on a student loan. As soon as I graduated, it was natural that I wanted to move to closer to the city and find a job. In order to find a flat, we had to pay a deposit and the first month of rent. This is where my first student overdraft monies went for. 2. Live Lagom. The progress. On a day of my deadline, I received a horrid news from home. My dad passed away. It was a shock and put me down for months, I wasn’t able to move from home. We had everything sorted for a move, and it was my first step to go and find a job but I couldn’t face the reality. I was a ghost. It took me few months to put myself together, and in a mean time, I have blown my student overdraft limit to the maximum. I was lucky that finally, I found a job but then I was earning a graduate salary. Whatever I earned, I was paying my bill, my basic needs and I was down to zero. That circle went for another year. I changed my job, earning a little bit more hoping my situation will change. I loved my job but we were working under pressure all the time. This means I often was working until late hours so coming home 8-9pm was a standard, sometimes even later. I didn’t mind that at the time as I was very dedicated and I really enjoyed was I was doing. However, by the time I was home I was just simply too tired to cook. I tend to just order a takeaway or use ready meals and go sleep. When I started my blog, my situation went even ‘’worse’’. As soon as I went home, I was either writing a post or scheduling, replying to emails or social media. I worked incredibly hard. No, I didn’t live on caviar and lobsters each week. It’s super easy to do that when you live in a city centre and have shops so close and zero time. I knew, this was taking a little bit too much so when IKEA Live Lagom project came across I knew I wanted to apply straight away! You can read here my first post for IKEA Live Lagom and my progress post on Live Lagom. This project completely changed my lifestyle. No, it didn’t happen straight away. It grew in me, week after week I started using my products kindly gifted by IKEA. I did tonnes of research, used our Facebook support group as inspiration and slowly changed my living habits. After seeing, that I started spending less and less that was a huge motivation! I started cooking minimum 3 times a week, and after cooking I would put leftovers straight to my containers. This also helped me keep the flat tidy. I now start my day with a 10min exercise, sometimes less sometimes more- depends on but also with daily smoothies.Thank to the Live Lagom, I have finally paid off my student overdraft! Something, I thought it would be impossible! Apart from financial benefits of the project, I also changed my lifestyle and now I live healthier and I feel much more motivated and energised. This is far best thing I did. Despite the programme has ended, but my involvement hasn’t. I will be IKEA Live Lagom ambassador for life. This is now my lifestyle, not just a 6 month programme. PS. you can read more in article The Mirror about my lifestyle. Let’s be honest, no one really wants to eat bread & ketchup all year round and it’s very depressing to eat cheap. However, there are few tips & tricks you can do, that you can still eat fresh and great foods but you can save up some money! Plan your weekly meals. Even if you can’t cook everyday, and just like me cooking 3-4 times a week, try to plan those meals per chosen day. For example: Sunday, Tuesday and Thursday and Saturday. Try to pick a day, when you know you will have time to cook. I try to cook Sunday large meal as I know I will be very busy on Monday etc. Buy only what you need for your meals and in cupboard. Don’t buy items that ‘’you may’’ use as most likely you won’t have time to cook and it will end up in a bin out of date. Cook large meals. Try to count ingredients to cook double portions, so even if you had a meal, you still have leftover for the next day or you can freeze rest. I was using my Ikea freezer to oven container and is really time-saving! Buy in bulks. If you buy some items try to buy more and freeze items and check offers. I often buy larger portions of chicken so I can freeze the rest as is usually cheaper to buy more. Just be careful with 2in1 offers, as sometimes the price is exactly the same as before and they just trick you to buy more. Take your own lunch and drink. Anywhere. Not just work but train, meeting in town or even a walk. I travel often and I end up always buying coffee in train or sandwich. Having these with me really stops me on spending money. Take some snacks to your bag as well if you going for a walk of meeting. There are few places in Manchester where you can bring your own booze like Howksmoore or Yara. I know some people will find this extreme but is really easy to get used to it. Store your food in containers. As soon as you get home, place your food into your containers as these are proven to keep your food fresh for longer. Prepare ready to use portions. I used to keep fresh vegetables for smoothies in my fridge drawer, and when I would become busy, this would go off really quick. It’s a great idea to chop them as soon as you go home and portion them in bags ready to just put into your smoothie. Shop cheaper. We used the shop in places like Tesco, Sainsbury’s or M&S but I realized that shopping been very expensive. We have now switched to shop in Aldi for a big shopping but when I am in town center I usually pop in there as well. My boyfriend used to hate Aldi, as in his opinion he couldn’t find anything. I blame the huge choice of products in other supermarkets as you get more than you need and end up buying more at the same time. In Aldi, when I follow my list, I never overspent. I get exactly what I need. Read more about smart shopping there etc. My mom always made me a shopping list stating what to buy and where at, so for particular products I would go to a shop A as this shop offer same products much cheaper than shop B. It’s funny how shopping in big supermarkets, made me forget these simple tactics! I still shop in Sansbury’s and other stores but more likely for products I can’t find in Aldi. Freeze what you can. If you bought more items than you wanted because there was a great offer on it, freeze the rest. I know it sounds obvious, but believe me- it’s easy to just throw to fridge the rest and forget if you busy. Just get into this habit of freezing up things. Don’t throw away ‘’out of date’’ products. Research them first. Most products are still fine after few days of ‘’out of date’’. I used to throw away loads of food like that and now, I got into a habit of checking online the actual use of that product. Research food. For example, rice in room temperature can only stay 2 hours and have to be thrown away after that or raw peeled potatoes should be used within 24h in the fridge. Some foods can’t be freezed and some can stay 4-6 days in the fridge after cooking. It’s worth to know that if you cooking meals for few days, as last you want is a poison yourself. Grow your own herbs and vegetables. If you can of course. It’s fun as well! I have used my egg shells to grow veg. Egg shells bring some great nutrition to your growing plants. Also use a boiled egg water to water your plants as well. Cold one of course! Great shout is this self-watering planter from Ikea! Literally genius product! Eat your cupboard food. I used to go shopping every single time my fridge started to look empty. Sometimes is good to just check what you got in your cupboards, and make your meal plan around that as well, rather rush to buy fresh one straight away. Cook at the same time. Use steam inserts to steam your vegetables at the same time while cooking potatoes, rice etc. It’s pretty pointless to use another water pan for that, don’t you think? Make a jar of tea instead of a cup. Most tea bags are strong enough to give an essence and flavour to fill a full jug plus while you bowling that water, you can just fill your jug instead. Turn off the radiator why cooking. Instead of pop into Primark and treat yourself in a comfy pyjama & socks! You will not only feel cosy but also you will use less energy. Having your food on the hob and oven on will automatically bring warmth so absolutely pointless to have the radiators on at the same time. Reuse your plastic bottles to store food. I have turned my plastic bottles into food containers. I used to keep them in bags, and sugar or flour was always all around the place. Just cut the plastic top and put your pasta, rice etc. into it. Cover with linen and twine! Voile! Cook your over-roped fruits. I did my banana pancakes from literally black bananas and it was delicious! Try to look into recopies instead of throwing them away. Don’t shop hungry. Like never ever do that. Try to grab a fruit or yogurt at least. It will really save you of buying pointless products you won’t eat anyway. Keep your eyes on out of date products. You can simply just apply the supermarkets tactic. Keep all short dates products at the front of your fridge and those will longer date at the back. write a list of products and stick to a quirky magnet in front of your fridge. Invest in a slow cooker or pressure cooker. Both can really benefit on save you time. You can either prepare your meal in the morning and come back to a ready meal or quick do the meal if you are in a hurry. * I took part in IKEA Live Lagom project, by opinion and experience is MY own! Just wanted to say – What an inspiration to others. Even after the sadness and loss, you picked yourself up and changed your life round. Have you published a book yet? Thank you Hannah, I know the pain! It's hard. You are young, you want to have fun and enjoy your uni life, instead of living on on edge. I think if you slowly introduce these are your habbits, you will difference and it will be easier for you to start after uni. Best of luck! This rings so true to so many people! Congrats for getting out of your overdraft I know how that feels having suffered after uni financially myself. Thank you Leanne! I know, there so many people like me! That's why I decided to write a guide hot to save money, rather just a report of my journey so i can help others as well. Some great tips here. As I cook for a family I do try to cook more and freeze but I really should be growing our own herbs. My kitchen window would be perfect for it! Oh you should try! It's really easy! I think we all guilty of that. It's the rush and lack of time these days!